The victory of the Middle Way and the degeneration of ideals that followed in its wake should not be seen in isolation from the distorted understanding of civil society among Tibetans in exile that enabled it; i.e., the understanding among a substantial number of Tibetans that the policies, pronouncements, and wishes of the leader—the Dalai Lama—must not be subjected to serious critical objections and dissent. This atmosphere has led to the use of the Dalai Lama as a prop by some, and to mention of his name as the crux of an argument’s merits by others. This warped sense of civil society has become one of the obvious characteristics of significant portions of the exile community. It is reflected in the dismissal of Jigme Ngapo from his position at the Tibetan Service of Radio Free Asia late last year; allegations of the exile leadership’s political machinations to exert influence over RFA have been asserted by several parties as the primary cause of his dismissal. Reliable reports have made it clear that this dismissal was very much in line with the wishes of the leadership in Dharamsala. Even if short-sighted officials in Dharamsala may consider the termination of Jigme Ngapo’s employment opportune, the whole affair is deplorable. For one thing, given the questions about Lobsang Sangay’s behavior (financial and otherwise) that have been popping up, it is no credit to exile efforts at civil society for its leadership to move to influence reporting and personnel issues at RFA. RFA is, after all, mandated by the U.S. government to retain objectivity in its reporting—reporting that must sometimes take in the doings of these self-same Tibetan exile political figures. Some of the complaints about Jigme Ngapo actually speak favorably to his understanding of the need for distance and objectivity, i.e., complaints that he never visited Dharamsala as head of the RFA’s Tibetan Service or requested a personal audience with the Dalai Lama during his tenure. And more recently there has come very reliable word of a particularly embarrassing incident, indicative of Dharamsala’s adamant intention to involve itself in RFA matters. Since many of the principle players in Jigme Ngapo’s dismissal were caught off guard by the furor that followed it, the Dalai Lama—ostensibly retired from political activity—decided to lend his authority and influence to the cause of quieting dissent on the issue. In a closed talk to Tibetan journalists at the 26th Mind and Life Conference in Mundgod in January, well after Jigme Ngapo had been dismissed from his post, he made it clear that he agreed with the complaints that the Tibetan exile leadership had been making about Jigme Ngapo’s independence (e.g., complaints about Jamyang Norbu being allowed to give commentary on RFA) and supported his dismissal. 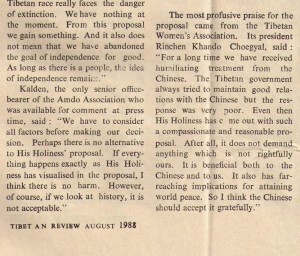 Most mind-boggling, though, was his statement that Libby Liu, the controversial (to say the least) head of RFA and the one who terminated Jigme Ngapo’s tenure there, had done much more for Tibet than Jigme Ngapo had ever done. Given the machinations to oust Jigme Ngapo that preceded this, having the Dalai Lama—who is seemingly unconcerned about any questionable behavior on the part of Libby Liu or Lobsang Sangay (the latter, after all, being an ardent supporter of his policy of retaining Tibet as a part of China)—pronounce favorably on the merits of one RFA official over another simply solidifies the perception that the wall that ought normally to keep exile political influence out of RFA’s affairs has been toxically eroded. It should be understood, when trying to read potential Chinese thinking about Tibet from the larger phenomenon of Chinese protests, that local protests in China are most commonly rooted in specific local issues; they are fundamentally different from protests that involve nationality issues and nationality discontents. These latter are inherently imbued with—tainted with, as many would see it—the potential for undermining crucial elements in the modern construction of the Chinese nation. The introduction of the national question into a protest automatically places it into a much more sinister category (as far as the authorities and many Chinese citizens are concerned) than that of protests caused by limited local grievances. And here the crippled nature of Chinese civil society becomes clearer. Setting aside those few, brave souls who do look beyond their own groups interests and raise their voices in support of broad human rights issues (and of course there are such people in China, let’s not forget), the sort of civil society backing for issues that transcend the personal interests of particular protestors is still quite weak. It does exist, of course, and when one sees manifestations of it, it is striking. But China is far from producing a civil society in which significant numbers of people will take a strong, public, dissenting stand on an issue removed from their own perceived interests. Consider that the civil rights movement in the United States during the 1960s only achieved the level of success that it did when a majority of the population—the non-Black population—was no longer able to avoid a gut-level sense of shame and anger over the bigotry, discrimination and worse that was visited upon one sector of society. That the majority did not suffer the same outrages inflicted on the Black population was beside the point. The situation was repugnant; it offended the sense of justice of the majority, which ultimately supported measures and actions to end it. And this, out of a sense of civil society; an awareness that it is largely the citizenry, not the government, that must ultimately set the agenda for social justice. that “Within these world-famous media companies, not only are the owners Jewish, but many of their important posts are filled by Jews. Although there are many newspapers and magazines owned by non-Jews, their advertising income depends, to a very large degree, on Jews.” Whew! One hopes Du Yongbin has been properly thanked for sounding the alarm on Jewish control of the media! And where has the author found such spectacular insights? Well, fortunately this bit is footnoted. His source is a one-stop go-to website for all things Jewish-Conspiratorial: www.jewwatch.com…! 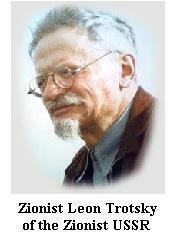 Du Yongbin’s embrace of the assertions of anti-Semitic cranks (the website’s homepage features a lovely graphic of “Zionist Leon Trotsky of the Zionist USSR”) can hardly be an error of ignorance. Yes, some may argue that such idiocy has wide currency in China. But in this instance it’s being aired in a journal that presents itself as a vehicle for scholarship. Its publication in Zhongguo Zangxue illustrates the ease with which, in the broad absence of liberal, civil society modes of thought, deterministic, essentialist beliefs are taken up to explain foreign attitudes concerning China’s treatment of Tibet. A pity Du Yongbin wasn’t around in Stalin’s waning years. He might then have been able to combine his belief in an overarching Jewish-American position on Tibet with a Stalinist/Marxist disquisition on Jewish… uh, make that “rootless cosmopolitan,” art, capitalism, etc. The tenor of Wang Hui’s comments is clear. And from them too one can understand the generally positive view that is given another work, one which focuses on the fantasy element, the Western view of Tibet as Shangri-La. Grounded in Orientalism, Wang Hui makes use of the Shangri-La meme, proposing that one aspect of Western hostility to China is rooted in the notion that China has destroyed the West’s cherished fantasy land. And so we find Don Lopez’s Prisoners of Shangri-La invoked by some writers in support of that position. Indeed, when the book was published at least one critic was angered that it would provide fodder for China’s overall position on Tibet. And one might surmise that that has been the case, given the references to it that can be found in Chinese writings. But there’s a significant difference between Prisoners of Shangri-La, as read in China, and Orientalism. To start off, Orientalism as used by Chinese writers is not a distortion of its author’s main thesis. This is what makes it so handy. But Prisoners of Shangri-La is something else altogether. Don Lopez does delve—in detail—into the fantasizing about Tibet that has become so markedly associated with the country. But in this he does not tie sympathy with the plight of contemporary Tibet uniquely to Western needs for a pure realm somewhere far away, nor does he deny the reality of what has happened in Tibet under Chinese rule. Indeed, he is quite categorical in describing China’s presence in Tibet with the terms “occupation” and “colonization.” Broadly speaking, recent Chinese writing on the subject doesn’t really represent a new development, save perhaps as regards its particularly skewed slant. Western scholarship has long been addressing the issue of a fantasy Tibet without in any way ignoring the horrors that have transpired there under Chinese rule. Already in 1996 a major symposium devoted to the subject, Mythos Tibet, was convened in Bonn bringing together many of the major Western academics (including Don Lopez) who have dealt with the subject in one way or another. Even before that, Agehananda Bharati (Leopold Fischer) authored a much-discussed piece on the subject in the mid-1970s. There’s something else that is quite telling about the position of Prisoners of Shangri-La in Chinese academic writing. While it is cited by some writers in China, many (if not most) of whom read it in translation, the actual translation is not accessible to the general public. It is not to be found, so far as I can tell, in any publicly accessible bookstore, nor is it possible for ordinary students and members of the public to read it. That, in and of itself, ought to make clear that its contents are not wholly or honestly represented by many of the Chinese writers who make use of it. As for Orientalism, that book is easily available in Chinese translation, a translation which includes a key to the pagination of the original English edition (so that, anyone, when citing it, can give the appearance of having used the original English-language version). Of course there’s no need in China to misrepresent Orientalism; it’s the perfect conversation-changer (when talk turns to the unpleasant subjects of political imprisonment, torture, etc., in Tibet) exactly as is. Its core idea makes it well-suited for use as an antidote against the insistence that specific grievances, facts, accounts of atrocities should be—must be—spoken of, written about and exposed before an international public, regardless of whatever identity one fixes on the speaker or writer. It is pressed into service to pronounce the content of what is said to be the mere, inevitable narratives of certain identity.